I really like the feeling when staying on the cruise, enjoy the sunshine and stunning view of Halong Bay. Travel through all the island here is one of the must-do you should think about this when traveling here. The tour guide has provided me a lot of informative information. Thank Phong so much. The best tours in vietnam . Halong Bay is one of the 7 natural wonders of our planet. That alone says you must do this boat trip when in Vietnam. You will not regret. We did the 1 day trip cruises tours with great services and staffs . We went to many islands. Did a lot of sightseeing and on the boat we had good meals and met a lot of people. The boat was new ans so nice with good sea food also. Nothing to complain about. Must try ! I really love this. I had a great time and some new friends on this trip. 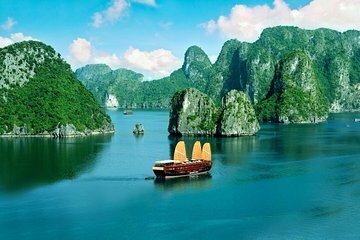 Ha Long Bay is a must-visit place even for Vietnamese. Highly recommend this trip to everyone. I will be back to Ha Long Bay. P/s: 5 for the food on the cruise - especially for the sea food.